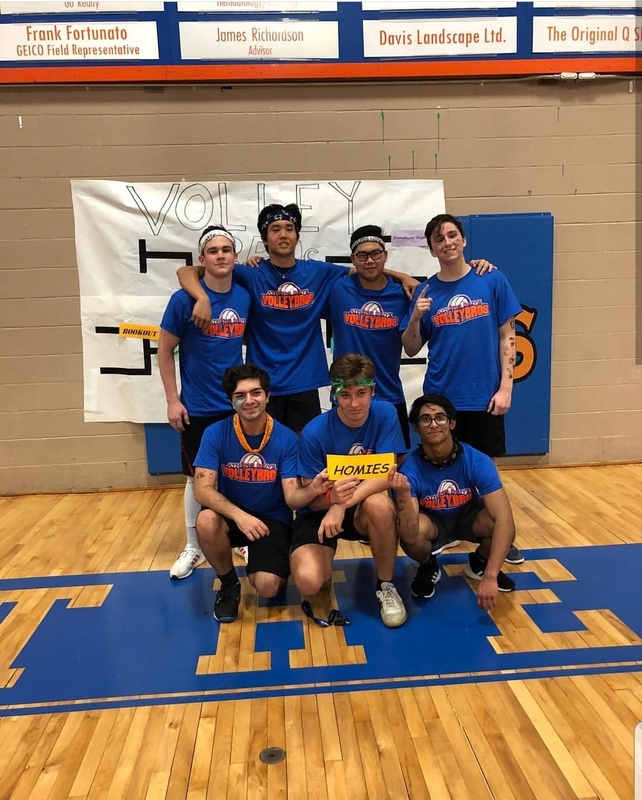 Volleybros, a tradition unique to the Athens Drive community, is a time for staff and students to come together for a night of laughter and competition. Seven teams competed against each other February 22 in this year’s volleyball tournament. Laylani Callaway, junior, and Izzy Bradsher, senior, served as DJs for the night, playing throwback jams and current hit songs. The light-hearted atmosphere made playing fun for all teams; even when they did not win. Volleybros is touted as the male equivalent of Powderpuff for girls. Typically, most participants do not have an extensive volleyball background but bring an energetic disposition to the table. A few of the players from the women’s volleyball team helped to coach the teams on what plays would best fit their players and the needs of the game. Additionally, other members of the volleyball team served as referees who enforced the rules of the game. Mya Mallard, junior, is a setter on the Athens Drive volleyball team and served as a referee at team practices some times. “[Being a referee for Volleybros] was a lot different than reffing volleyball games for girls… because the boys aren’t as skilled as the girls. They have less experience and don’t understand all the rules of the game,” said Mallard. Overall, the student body reacted positively to the humor of the volleyball tournament. In past years, an admission fee was required to watch the teams play. However, this year the fee was waived and student participation appeared to increase as a result. “I was not about to pay to see that. Bold of you to assume I would,” said Ava Darden, junior. In another break from tradition, the staff team won this year’s tournament. Conner Bayer, social studies teacher at Athens, is the volleyball coach and teamed up with Mr. Barry, Ms. Shelton, Ms. Stevenson and Ms. Faircloth for Volleybros. Mrs. Clarke, math teacher, played volleyball when she was in high school, making her to be a valuable asset to the staff team. Team Homies celebrating a night of sportsmanship and fun.